Sony introduced new design aesthetics with the Xperia Z called OmniBalance and the Xperia Z1 brings the latest refinement. The chassis of the 5" flagship is constructed out of a solid slab of aluminum that's extruded, carved and anodized. After all this, all that's left is the rectangular frame to which all the ports, slots and buttons are attached (including the signature aluminum power button) and then two scratch-resistant sheets of glass are put on the front and back to finish the praised angular look. The Xperia Z1 measures 144 x 74 x 8.5 mm, which is a little bigger than the Xperia Z in all dimensions. Then again, when you consider that Sony has blessed the Z1 with a large 1/2.3" sensor and a 3,000mAh battery - the two smartphone features that drive the thickness up the gain is actually impassively modest. In comparison, a Nokia Lumia 1020 is 10.4mm thick not counting the camera hump (its sensor is twice as big though) and it only has a 2,000mAh battery. The Samsung Galaxy S4 zoom has a 1/2.3" sensor and is pretty chunky (by smartphone standards), though that's because of the optical zoom. We'll talk about Sony's answer, the QX detachable camera modules, later. 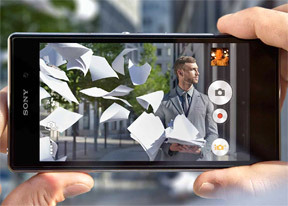 While Nokia and Samsung sacrificed the design and pocketability for the sake of the camera, Sony went the other way and put the best camera that would fit in. And the result is quite impressive indeed - with sensor twice as big as most competitors and resolution far higher than them, the Z1 camera is the best-spec'd this side of the Nokia PureView family. The Sony Xperia Z1 shares much of the layout of its functional elements with the Xperia Z, although there are some key improvements that we greatly appreciate. Above the screen, you get the earpiece with the LED status light residing within it. The earpiece is flanked by the front-facing camera on the right, and the ambient light and proximity sensors on the left. Since the Xperia Z1 relies on virtual navigation buttons rather than hardware ones, there's nothing of interest at the bottom. The primary microphone is nowhere in sight, so we assume it's underneath the large grille at the bottom that also holds the loudspeaker. The loudspeaker itself had to be moved to the bottom, because its place on the right side is taken by the dedicated camera key. The camera key is a bit on the small side and is not the most comfortable to press, but it's still much better than nothing as was the case with the Xperia Z. The Z1 is a proper cameraphone and Sony was keen to show it. Also on the right are the power/lock key that has become a signature feature of the Xperia lineup lately, the volume rocker and a tiny flap that hides the microSIM slot. The flap is rather easy to operate and will cause no drama in those rare occasions when you are exchanging SIM cards. On top you get another an exposed 3.5mm audio jack, which is really a great step forward from the awkward plastic lid offered by the Xperia Z. The Sony Xperia Z1 actually has better water-resistance than the Z with its IP58 rating and the fact that it was achieved while improving usability is quite impressive. On the left you get the MHL-enabled microUSB with USB host support and the microSD card slot. The dock connector resides underneath the two. Finally, turning our eyes to the back we spot the 20.7 megapixel camera lens, which carry the Sony G-lens branding. There is small marking next to it indicate the larger sensor sitting underneath, while the LED flash sits just below the lens. Underneath the back cover sits a huge 3,000 mAh battery that should keep the new Sony flagship going for up to 15 hours of talk-time or 850 hours of stand-by on 3G networks. Both numbers are a market improvement over the Xperia Z, but we'll have to spend some more time with the smartphone and do a proper test before we find out its real life performance. We now come to the most interesting part of the Sony Xperia Z1 hardware inspection. The smartphone comes with a 5" 1080p Triluminos display, backed up by the company's X-Reality engine. Sony has already demonstrated the potential of that combo with the Xperia Z Ultra, so we know that it's far better than the company's screens from the first half of the year. The pixel density breaks down to 441ppi, which is as good as it gets in terms of sharpness. No matter how closely you look, you won't be able to tell pixels apart and images will always look tack sharp (provided they have enough resolution in the first place. A key area that has saw improvement with the latest Sony display tech is viewing angles. Those have been a long-standing issue with all of the company's screens over the past few years, but now things are looking much better. You do get contrast compression when you look from very wide angle, but everything still remains legible. At this point the differences between this and the best screens in business is more about the high-tech vide that you get when the icons appear as if painted on the screen. In terms of usability though, the Xperia Z1 does as good as any of its competitors. The native contrast of the Sony Xperia Z1 display is great and surprisingly much better than that of the Z Ultra. Colors are also nicely punchy, but still fairly accurate. If you'd like a bit of extra punch to your images and videos you should enable the X-Reality engine, which is the successor of the Mobile Bravia Engine. It aims to improve sharpness, reduce noise, while also boosting contrast and saturation and it does a pretty decent job of it. Even more impressively, the Xperia Z1 screen is much less reflective than those of its predecessor and the Sony Xperia Z Ultra. This, combined with its higher brightness helped the new Sony flagship smartphone to a great score in our dedicated sunlight legibility test. You will have very little issues with this one even in the sunniest of days. All things considered, the Sony Xperia Z1 screen may not earn it too many bonus point in today's market saturated with mind-blowing displays, but it's no longer a disadvantage as it was on the Xperia Z - in fact it even beats some of its rivals.